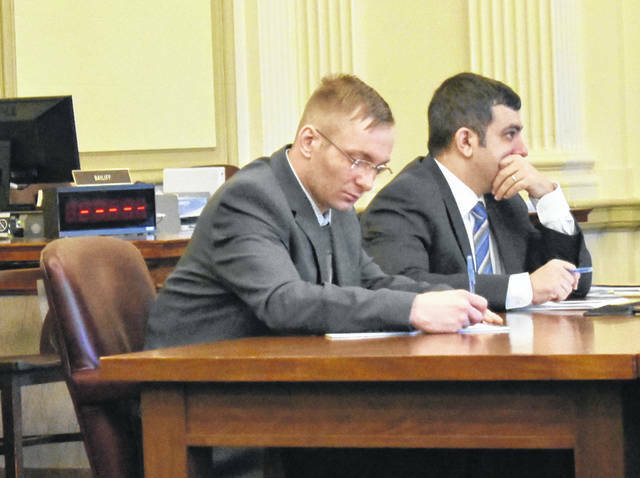 Attorney Scott Evans, right, sits with client Jamie McLaughlin, left, in Clinton County Common Pleas Court on Wednesday. McLaughlin was found guilty of felonious assault and having weapons under disability. WILMINGTON — A Blanchester man was found guilty Wednesday of felonious assault and having weapons under disability. Jamie McLaughlin, 31, will be sentenced on Dec. 20 for the two charges related to the May 2 shooting of Mary Neace, his then-girlfriend. Bond was revoked for McLaughlin and he was remanded to the Clinton County Jail to await further court orders. In June, McLaughlin was indicted by a Clinton County grand jury in relation to three different crimes: the aforementioned shooting; a May 6 incident in which McLaughlin was allegedly brandishing a machete and threatening two people who spent the night at his home; and, the discovery of stolen property on May 7 at McLaughlin’s home while executing a search warrant. Before leaving the courtroom to deliberate a verdict, the 12-person jury — four men and eight women — heard closing arguments from prosecuting attorney Katie Wilkin and defense attorney Scott Evans. Wilkin spoke first, stating that the injuries to Neace were not due to sexual activities, drug usage, or any other events prior to the May 2 incident. “What matters today are the facts that the state proved, which are that on May 2, 2018, in the Village of Blanchester, County of Clinton, State of Ohio, Jamie McLaughlin did knowingly cause physical harm to Mary Neace by use of a deadly weapon,” said Wilkin. She then referenced testimony from Neace where, according to her, McLaughlin forced her to call a man he believed she was seeing, and the abuse she received on May 2 while restrained by McLaughlin, including burns from a torch, from being punched, and from being struck with a whip. Wilkin also referenced how Neace required extensive surgery after the incident including having her spleen removed; because of that she must now receive vaccinations or else be at increased risk of disease. Scott Evans, during his closing argument, said McLaughlin was not guilty due to him not fleeing the scene nor attempting to cover anything up, and that he called emergency services about the shooting. Evans also argued the felonious assault charge brought against McLaughlin was because of “mob mentality” putting pressure on the Blanchester Police. As for the restraints, Evans argued this was “a lifestyle choice” of the two. As for the shooting, he argued it was an accident, saying his client didn’t know the gun was loaded. In addition to the felony 2 assault and felony 3 weapons charges, McLaughlin will appear in court for other charges at a pretrial on Nov. 6. These charges include two felony 3 abduction charges, two misdemeanor 1 aggravated menacing charges, and felony 5 receiving stolen property. A felony 2 attempted murder, misdemeanor 1 assault, and a third abduction charge were dismissed.